Let’s take a moment to remember and rejoice what we accomplished in 2017 as Mozillians. Walk through the past shows the path for future. Every contributor of Mozilla India is up in joy as their past year have a lot to be listed. The curve of Learning and contributions have a significant increase in every individual contributor. 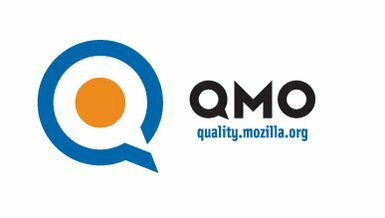 Though we have a lot of contributors at Mozilla India contributing to different projects, organising events and promoting the mission of Mozilla but what we believe is that “Quality rather than Quantity counts.”Now is the time to show our quality. Here we showcase our QA contributions from 2017. 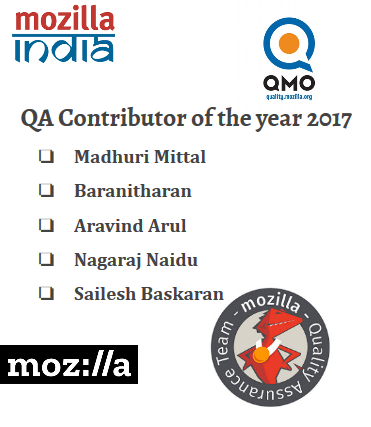 In 2017, QA had 70+ vibrant contributors from Mozilla India who worked with enthusiasm throughout the year and participated in 100+ events. They actively took part in QA bug events like Bug Triage Day, Bug Verification day, QA Test Day, and Reporting bugs in-person and online. Our QA Team’s contribution was not limited to Test Day events. They started teaching the web to others. Several QA contributors organised bug events in their colleges and brought many new contributors to the community. Because of their precious time and efforts, we have got such broad contributions this year. Currently, we have 200+ members in our Mozilla India QA Telegram channel where information about QA projects and more are shared. On behalf of the Mozilla community, I convey special thanks to all of them for their hard work and for supporting us in several ways. Here is a list of our proud 71 contributors. After thorough analysis, we have chosen the top five contributors from QA Team. We congratulate them on being the QA Contributors of the year 2017. Apart from bug events we organised and involved ourselves in many important campaigns. Here are a few Interesting stories we had while hosting testing events. To celebrate International Women’s day and women in tech, our QA contributors and Womoz organised events with their respective campus clubs on March 8, 2017, and had hands-on on QA. Many among the audience were not Mozillians and helped female students to join this community. During May and June 2017, we organised a campaign called India Uses Firefox Nightly to bring more power users to use Firefox nightly in India to improve the future stable Firefox build. We thank Biraj Karmakar who initiated this campaign in India. Nearly 15 events organised in India and there was a good impact on social media too. We appreciate all the organisers for taking this campaign forward in their local communities. October was an exceptional month for Mozilla. Mozillians around the world worked day & night for the launch of #newfirefox called Quantum. Mozilla community organised Firefox Quantum Sprint to test the power of Quantum, and made sure websites around the world would work well on it. As a part of this happy moment, Mozilla India enthusiastically organised nearly 50 events in India and tested 1000+ websites for compatibility. At the end of the month, we had a QA call for newbies to help them participate in QA Test Days and this call has been archived on YouTube. We had amazing times together as a community in 2017. We express sincere gratitude to all community members for their wonderful initiatives and their unrelenting support in all aspects. We also like to thank Mihai Boldan, Mike Taylor and Pascal Chevrel for mentoring us. My personal thanks also to Prasanth, Surentharan, and Krishnaveni for their companionship and leadership in organising bug events. Let us continue with this momentum this year and bring on more leaders. #MozLove to all the contributors, because you are the key to this success community!! !